Strong attempts to push Bitcoin lower have failed. Dips continue to be bought. Bitcoin continues to maintain daily closes above the 5000 value area. This continued price action behavior is one that should be considered extremely bullish. The first close Bitcoin had that was above the $5k value area was on April 5th, 2019. And ever since that date bears have made strong and powerful attempts to push prices below and keep them below the key $k area. On many time frames under the daily timeframe, there have been multiple bear traps that have enticed many short sellers to pile in once price has broken the $5k zone to the downside. But I do have some concerns about Bitcoin’s ability to maintain this value area in the short term. The midpoint in the Law of Vibration time cycle occurred on April 12th, 2019. Bitcoin has rallied and gained value from the beginning of this current Law of Vibration cycle on January 6th, 2019 all the way through to the key time pivot on February 23rd, 2019. From January 6th, 2019 to April 12th, 2019 is 96 calendar days. This falls within the timeframe and range of Gann’s 90-day cycle of the inner year. Gann said that the 90-day cycle was the most important cycle of the inner year because you often see major and minor trend changes after a big move. He specified that if an instrument moves in a very fast manner, then the 90-day cycle could be extended to 99-days. And today is the 99th day. The question is: will Bitcoin trade below $5k? I am definitely leaning on the bias of Bitcoin not trading below $5k. I believe the best opportunity for this to happen between the dates of the recent 2019 high of 5488 on April 10th, 2019 to April 13th, 2019. There was ample opportunity for bears to push Bitcoin lower between last Thursday and today. But the dips keep getting bought. There are a significant number of buyers that have participated in keeping Bitcoin above 4800. It is easy to get caught up in the euphoria of the big price spikes and continued higher highs that Bitcoin has made, that we sometimes forget how a bullish trend looks. This is especially true when we think of the all the rallies and false breakouts that occurred From December 2017 through all of 2018 and into early 2019. There is a direct and inverse relationship between the price action of 2018 and the price action between late February 2019 and the current month of April 2019. Instead of seeing weak rallies on low volume that then get annihilated by massive short sellers, we are seeing a mix of heavy volume sellers and weak volume sellers pushing prices lower but then massive buying participation and support. This is the exact kind of price action behavior that we want to see to confirm a bull market – or to at least confirm a bullish bias in the short run. 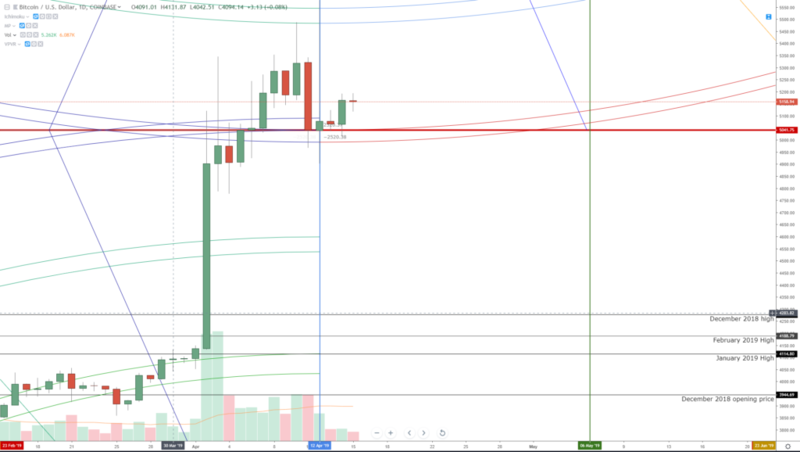 If Bitcoin can maintain a value above the $5k value area between today (April 15th, 2019) and the beginning of May, then we should see a significant rally to the next key value zone: $6800.